WHO Regional Director for Africa, Dr. Matshidiso Moeti (second left) visits Kinshasa, the capital of the Democratic Republic of the Congo (DRC), to discuss ways to mount a rapid, effective and coherent response in order to stop the ongoing Ebola outbreak. 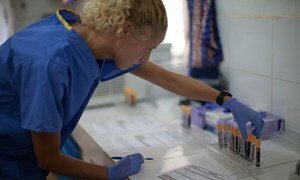 The United Nations health agency is deploying technical experts to the Democratic Republic of the Congo (DRC) amid an outbreak of Ebola virus near its northern border with the Central Africa Republic, the agency’s regional director for Africa confirmed. Matshidiso Moeti visited the capital Kinshasa on Saturday to discuss with national authorities and partners ways to mount a rapid, effective and coherent response in order to stop the ongoing outbreak. “I encourage to public to work with the health authorities and take the necessary preventive measures to protect their health,” Dr. Moeti said. He noted that the UN World Health Organization (WHO) has already mobilized teams, and is also ready to provide the technical expertise and leadership required to mount a coordinated and effective response. The visit follows notification by the Government of an outbreak in the Likati health zone, in the north. At least three people have died, as of Saturday, and eight additional people are reported to have Ebola. A Ministry of Health team, supported by the WHO, is scheduled to arrive in the epicenter of the outbreak today. “The health zone is situated in the remote, isolated and hard-to-reach northern part of the country, with limited transport and communication networks - factors that all impeded transmission of information about the suspected outbreak,” WHO said in a press release. In the meantime, WHO is recommending that travel and trade are not restricted with the DRC, based on information currently available. “The full extent of the 2017 outbreak is still not yet clear. Extensive investigation and risk assessments are being conducted and the findings will be communicated accordingly,” the UN agency said. The Global Outbreak Alert and Response Network (GOARN) has been activated to provide additional support, if required. In addition, reinforcement of epidemiological surveillance, contact tracing, case management, and community engagement are under way. This is the eighth outbreak of Ebola virus since it was discovered in the DRC in 1976.